1. Cook McCain peas per instructions on packet and cool. Place peas and avocado into a medium sized mixing bowl, add lime juice and mash roughly using a fork. Add olive oil, garlic, onion, coriander, tomatoes and cayenne pepper and mix well to combine. Season with salt and pepper to taste and serve with vegetable sticks and brown rice crackers. 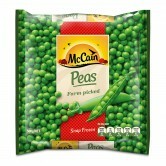 1 Cook McCain peas per instructions on packet and cool. 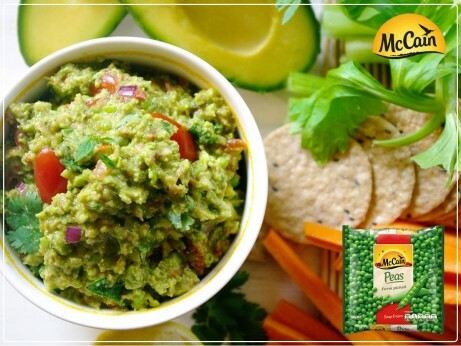 Place peas and avocado into a medium sized mixing bowl, add lime juice and mash roughly using a fork. Add olive oil, garlic, onion, coriander, tomatoes and cayenne pepper and mix well to combine. Season with salt and pepper to taste and serve with vegetable sticks and brown rice crackers.